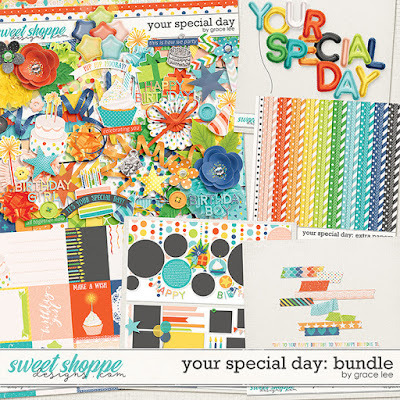 Your Special Day: Bundle will help you celebrate a very special day of yours or someone you love! The rainbow palette allows this kit to be used for both boys and girls, young and old; it is a birthday collection that you'll use again and again. The elements include: 1 balloons, 1 banner, 2 bows, 1 branch, 6 buttons, 2 candles, 2 charms, 1 doily, 9 flowers, 2 frames, 8 gift bows, 2 leaves, 2 paint, 4 ribbons, 1 ricrac, 6 ruffles, 2 scatters, 8 stars, 10 stickers, 1 string, 2 tags and 8 word art. and 10 pieces of washi tape only available in the bundle.